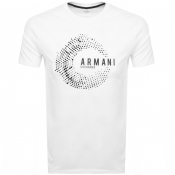 Armani Exchange t shirts available at Mainline Menswear to achieve the classic designer look. Our varied collection of tee shirts and polos include crew necklines, V neck designs and ribbed polo collars to suit every occasion. Available in bothtimeless colours such as white, black and navy as well as brighter tones of redand blue, there is sure to be something for you. Whether you like discreetlogos or bold graphics, Mainline Menswear stocks items suited for everyonespersonal style.. Check out the rest of our Armani Exchange products here..